How do co-operatives work in Rojava? 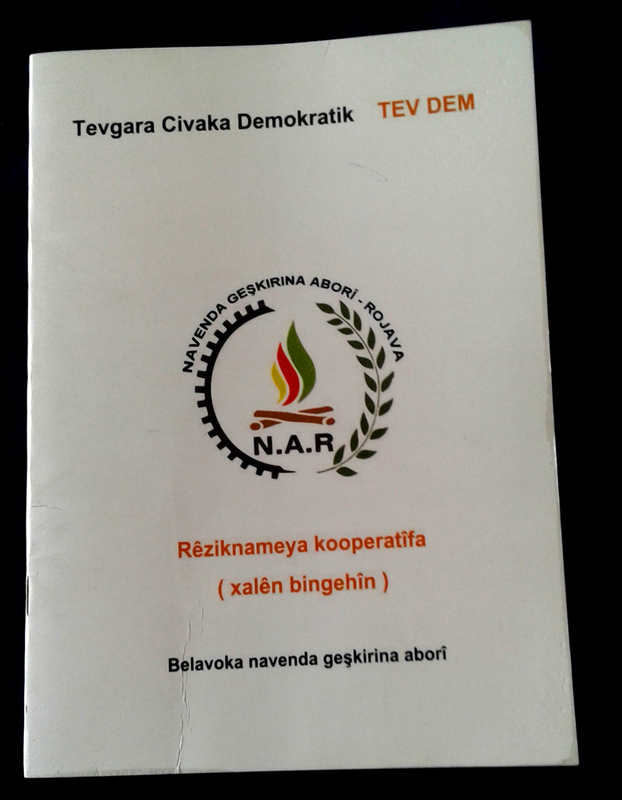 This is an official booklet produced by the Social Economy Development Centre, which is a part of the TEV DEM [Movement for a Democratic Society]. 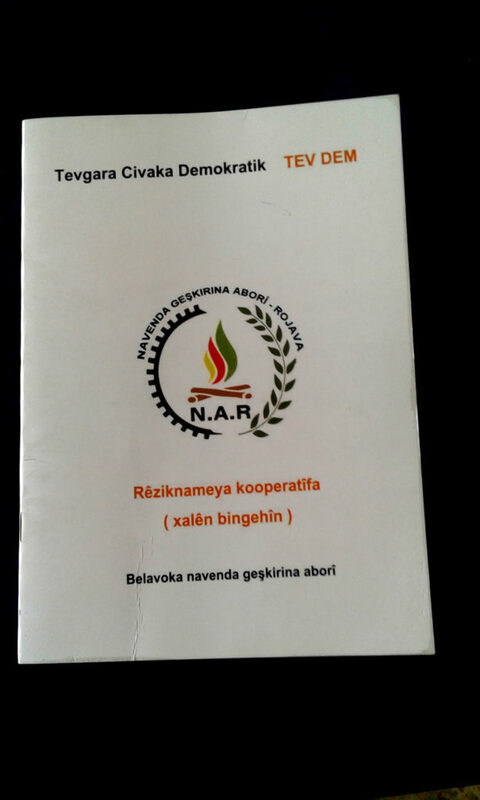 It lays out the basic principles under which co-operatives in Rojava run, based on decisions made after many meetings, which were attended by all of Rojava’s economic committees. This translation of the book is taken from an Arabic version, while the pictured is the Kurdish language version. The translation has been verified by friends in Rojava, who confirm that this is the current and complete version at the time of publishing this article. 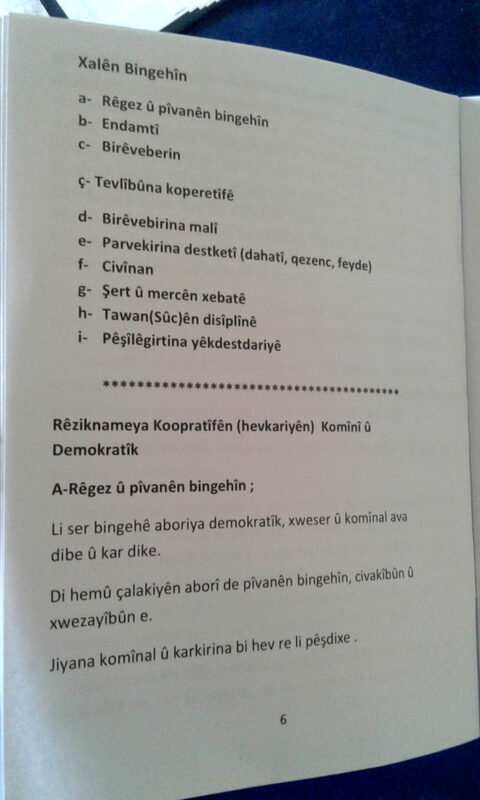 The Kurdish name for the book is “Rêziknameya kooperatîfa, xalên bingehîn”, which roughly translates as “Co-operative guidelines (basic principles)”. Distribution of gains (Income – procurement – profit). Accountability for errors and faults. Regulation and operation on a social-economic democratic basis. Working on the development of communal life and co-operative work through economic events based on social and natural standards. Freedom and equality as principles for practical and administrative life, and women taking their rightful place in all commissions. Commitment to securing the needs of the community, the communes and their members. Working to achieve human dignity within participatory work through dialogue based on social justice, work, ethics, and democracy and participation. Alongside its commitment to responsibility for its members, it must abide by its responsibilities towards the nation, society and humanity in general (According to what is possible). Anyone can participate in the community and become a member of the co-operative movement. Members of the commune who have been approved by the commune are entitled to become members of the co-operatives. Members must comply with decisions made by the co-operative. They have the right to participate in the decision-making process, implementation, follow up and monitoring of implementation. The terms and criteria proposed and decided by the co-operative are principles and criteria adopted by all members. The management’s members are at the same time workers in the co-operative, everyone is committed to working. One member only of any family may become a member of a co-operative.It is not allowed for more than one person to become a member of the bodies. The person is entitled to a membership of one commission only and does not have the right to acquire membership in more than one commission. A person cannot be a member in the Administrative Commission, member in the Financial Commission and member in the Follow-Up Commission at the same time. The Administrative Commission is separate from the Financial Commission; it is not allowed that members of the Administrative Commission can be members in the Financial Commission. Selection and exclusion of the membership of all the bodies is done through organised democratic election and membership shall be for one year. To agree on the implementation of decisions and projects, 60% of votes are required. All decisions taken are recorded and documented; meetings are documented in the form of written reports. Meetings are held in good order and according to a structured program, and in case of emergency and problems in communication, three members can hold emergency meetings. It is considered that all members of the co-operative are members of the commune and make a place for themselves in communal life. All the co-operative’s members are members of the General Assembly. The General Assembly meetings are orderly; during the meeting there is an evaluation of the general situation and of the co-operatives’ events. They define duties and responsibilities and set out programs, being responsible for defining the duties and responsibilities. The Administrative Commission is formed within the General Assembly and is made up of at least three people. This commission implements the resolutions of the General Assembly, acts according to the duties and responsibilities specified by the General Assembly and submits all its work to the General Assembly in a written report. The Financial Commission is appointed by the General Assembly, and it consists of at least three members. The duration of this commission is one year. This commission manages the financial work for the co-operative. Every week it submits a report of its work to the Administrative Commission, and also submits a monthly report to the Administrative Commission. Quarterly, it submits a report about their events to the Co-operative’s General Assembly. The commission records their work in the accounting book every day. The follow-up process is generally done by the co-operative commissions and meetings. If needed, a special follow-up commission is formed by the General Assembly consisting of at least three people. Members are not entitled to be members of other commissions such as the Financial or Administrative. It submits a report about its work to the General Assembly and to the Administrative Commission. This coordination takes place with the participation of members from the Administrative, Financial and Follow-Up commissions and three other members from the co-operative. The mission of this coordination is to develop the co-operation between the commissions and the management. It holds a meeting once a month; evaluating the commissions’ reports during their meeting and taking the necessary decisions. After each meeting, a comprehensive report about their monthly business is prepared and submitted to the General Assembly Meeting which is held every three months. Joining the co-operative is based on money, work and participation in responsibilities. The lowest share is one and the highest share is five. People with capital can join and participate in the co-operative. The stake can be borrowed from the co-operative’s fund and paid back in accordance with the conditions specified by the co-operative. The Active Member: is the member who participates in the co-operative’s work with their mental and physical efforts. The Financial member: is the member who participates in the co-operative’s work with their money only. There is a general fund for the co-operative through which all imports and exports of the co-operative are managed. These imports and exports are recorded daily and entered in the accounting book. The Financial Commission counts all the monthly and annual business and following the drawing up of accounts, they are recorded in two copies, one for the Financial Commission and the other for submission to the meeting or the management. A section for the requirements and activities of the next phase: where the co-operative can run the planned businesses and projects in the program and secure the raw materials, technical tools, repairs and purchase of equipment…..etc. A section distributed to the members: each member takes according to their work and their requirements in a fair manner and according to the co-operative’s situation. A section distributed on work, activities and general supplies for the society and the commune: this ensures the availability of health and educational supplies, basics (electricity, water, roads, sanitation, fuel, artistic and sporting events, all the supplies for the society, and provides support to the commune’s members in sickness and other situations. The Financial Commission can monitor the financial records as and when needed. All expenses must be recorded in systematic accounts. Two members of the Financial Commission and one member of the management should approve the accounts. Everything must be recorded in these bills in detail / on what has been spent, the amount that has been spent, date of exchange, the issuing entity…etc. It is necessary that working hours are recorded, the start times for all workers and hourly workers need to record all hours worked in the book. The work carried by the worker should be documented so the worker knows what job they carried out and receives their payment at the end of the month for that work. 50% only for the owners of capital and this ratio can be decreased if necessary. 30% from the first year of its establishment. 25% from the second year. 20% in the third year. 15% in the fourth year. 10% in the fifth year. Which means the proportion for the co-operative must reach a level of 10% within five years, and in the year in which the capital increases the rate slightly, this number is added to the joint fund to boost the co-operative. 20% for the general fund of the commune in order to ensure the general requirements of society and to develop the commune. Members who participated in the co-operative’s work with their knowledge and efforts obtain a high percentage. Members who participated in the co-operative’s work with their capital only and didn’t participate in the commune obtain the lowest percentage. Members who participated in the co-operative’s work with their capital, knowledge and effort obtain the highest percentage. The ultimate goal of the members’ participation and joining the co-operative is to work. If some work cannot be done by the members then it is allowable to bring people from outside the co-operative with the necessary ability to carry out that work. The duration of the work is six months or a year and at the end of it they will either become permanent members of the co-operative or take advantage of and learn from the experience of co-operative members. If the co-operative suffers a loss in the first year of running, the management will be replaced with new management appointed by a decision of a meeting of all members. If the co-operative loses in the second year of running, the problem can be dissolved with the agreement of a majority of the members. If the co-operative loses in any year, the administrative and financial commissions’ members are to be replaced, the decision recorded and they will banned from membership of the administrative and financial commissions for two years after the loss. If the co-operative makes a loss twice during five years, then the administrative and financial commissions’ members who were the reason for the loss are banned from membership of the administrative and financial commissions for ten years. The general community and all the co-operatives’ commissions hold their regular and emergency meetings in order to make decisions and develop plans. The general community holds the co-operative’s meeting on the third day of each month and during the meeting they discuss the action plan, the general program and make decisions. Commissions and units of the co-operative hold their meetings in accordance with their activities and must meet regularly every month. They have to submit their reports to the co-operative’s meetings, which are held regularly each month. Each commission must record their weekly activities in their books, as for the public meetings (monthly meeting, quarterly meetings, the general meeting and the emergency meetings) to be organised in forms of reports submitted in meetings and upper bodies. If a member misses a general meeting without permission or justification, he must explain himself. If there is a repeat and he misses twice without permission and justification, he must report on his absence to the general meeting. If absent from the general meeting three times, his membership can be withdrawn by a decision of the general meeting and he can be deprived of all his rights and shares. The program and method of work are based on the safety of society, people and nature and of course must make security measures the first priority. Honesty and cleanliness at work and the performance of other requirements according to physical, spiritual and health protection. All work terms must have human safety as a priority and any problems or serious accidents must be dealt with immediately and an appropriate solution found. All the requirements such as doctor, medicine, medical and hygienic equipment, etc must be taken care of. Upon the occurrence of any serious accident during working hours, the co-operative and the commune is to treat the injured person and upon a death of a worker during the course of his employment, the co-operative and the commune sponsor the family of the deceased. Evaluating mistakes and accounting errors in accordance with the terms and standards of the Democratic Society Movement and the Court of social justice. Serving the enemy in terms of military, political, economic or cultural interests or betrayal of the community and the people’s liberation struggle. Racism and sectarianism: any behaviour which shows contempt or minimizes the diverse cultures of the peoples of Kurds, Arabs, Assyrians, Syrians, Chaldeans, Armenians, Gagan, Alawite, Sunnis….etc/ demeans the traditions and sanctity of the society, of the martyrs, human dignity or burns images and flags. Theft, fraud, manipulation of the potential and values of the co-operative and the commune for personal interest and gain, following family feuds, establishment of gangs and holding talks against the society and its progress. All of these errors and faults are assessed and recorded by the commune’s community and the General Meeting of the co-operative. The highest amount of capital participation: does not exceed the upper limit of the capital for one million euro. The middle amount of capital participation: does not exceed the middle limit of the capital for two hundred thousand euro. The lowest amount of capital participation: does not exceed the lowest limit of the capital for fifty thousand euro. Anyone participating in a commission of any co-operative is not entitled to become a member of another co-operative’s commission. Based on these criteria and self-democracy decisions exclusive financial power is prevented.